Turkish cuisine is as richly diverse as the country itself, which brings together the influences of Europe, Asia and the Mediterranean. Istanbul shares with its residents and visitors alike a great love affair with food. Almost every dish has its own neighbourhood, and a best address at which to enjoy it, which makes for a long list of places to stop for lunch, dinner, afternoon tea, or a snack. 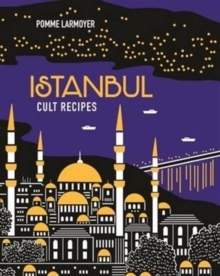 Pomme Larmoyer's Istanbul Cult Recipes is a compilation of tasty recipes from Istanbul cuisine and recommendations of where to go and eat when you visit. Split into chapters entitled At the Kahvalti Salonu (breakfast); The Meyhanetable (meze and fish); Lokanta, kofteci and kebabci (soups, meats and rice); At home (family recipes); Street Food; and Turkish Delights (sweet things), there are plenty of incredibly delicious dishes to give you a taste of Istanbul. Lunch on a meze of Chickpea pockets, Mussel pilaki and Samphire salad with almonds; dine on Sauteed lamb with smoky eggplant or Spicy mutton kebabs; enjoy Istanbul street food like Pide and Islak burger; and indulge your Turkish sweet tooth with Baklava, Vanilla milk pudding and Pistachio kadayif.Each chapter also features a region of Istanbul so you know exactly where to eat when you're wandering the streets. In Karakoy visit Namli Gurme for an endless breakfast on Sunday afternoon; in Fatih head towards the Egyptian Bazaar and get lost amidst the saffron, pepper and paprika; pop into Aytekin Erol in and revel in the different flavours and colours of Turkish delight; and in the district of Ortakoy don't miss the opportunity to visit the street dedicated to kumpir, potatoes stuffed with everything you could want. Are you hungry? Welcome to Istanbul.